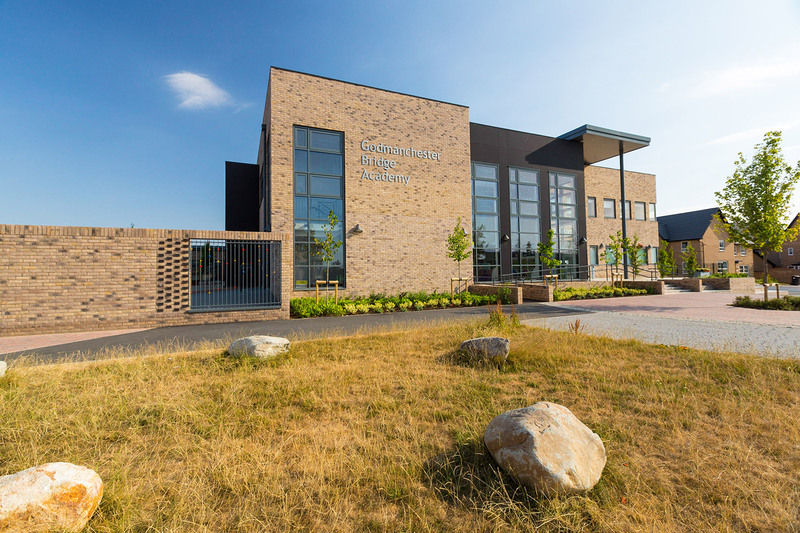 Our commercial architecture team worked with Kier Construction to design and deliver a new two form entry primary school (420 pupils) and 52 place nursery building for the Cambridgeshire County Council Major Projects Framework. 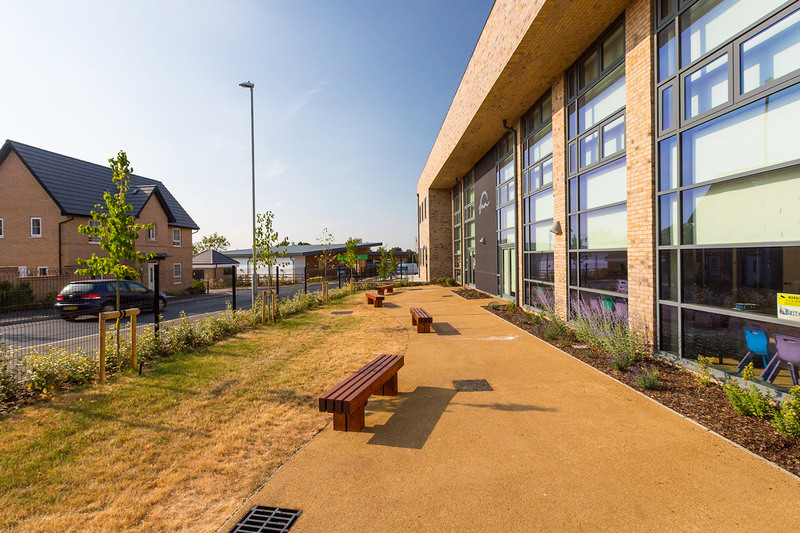 The new school, completed in November 2017, was delivered as part of a Section 106 agreement for the Bearscroft Farm housing development. Located on a challenging site with a crossfall of seven metres, the site was segmented into three distinct tiers – with turf sports pitches on the highest tier, hard surface sports courts to the middle tier and the school located on the lowest tier. The school is formed in an L shape with a two storey teaching block running north to south, which comprises eight classrooms, a large hall which can be subdivided into a large and small hall, school kitchens, double height library and ICT area as well as the school administration and staff areas. The single storey teaching block runs from east to west and contains six classrooms including two reception classes. This block has been treated with a sedum roof which visually extends the landscaping. All classrooms open out onto a landscaped play area which allows pupils to be dropped off and picked up direct to their classrooms. All classrooms have lots of daylight and natural ventilation. The nursery has been designed as a separate block within the overall site, providing the flexibility to be managed by the academy or from an independent nursery operator. 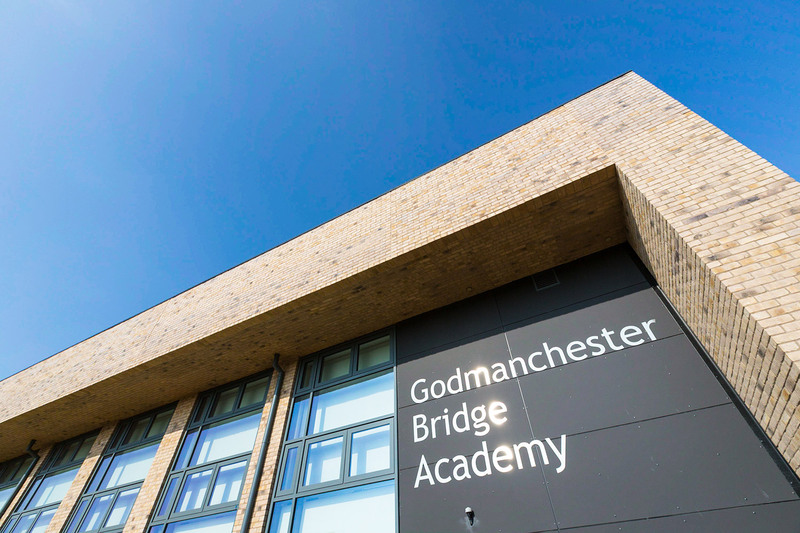 During a lengthy planning process which included a Design Quality Panel Review, public consultation and presentation to Godmanchester District Council, emphasis was placed on ensuring the school was designed to an extremely high quality. The quality of the brickwork detailing earned the scheme a nomination by the brick manufacturer onto the Brick Awards longlist for Education, 2018.